John Bernard Feit tells the court he will not testify in his trial for the 1960 murder of Irene Garza as defense attorney Carlos Ortegon, right, listens in the 92nd state District Court Wednesday, Dec. 6, 2017, at the Hidalgo County Courthouse in Edinburg. EDINBURG — A wrestling match between his vanity and common sense. This is how John Feit, who’s on trial for the Easter weekend murder of schoolteacher Irene Garza in 1960, described his decision when asked whether he would testify in his own defense Wednesday. His common sense ultimately prevailed as he told the judge he would not take the stand on the advice of his attorneys, at which point the defense rested its case Wednesday afternoon. The prosecution rested earlier in the day. But before reaching the decision, which was outside the presence of the jury, a conflicted Feit explained that he felt “kind of between a rock and a hard place.” Appearing stoic in his consideration of testifying, this was the first time the defendant, whose family has not been present in court, spoke since entering his not guilty plea the first day of trial. Although he did not specify what these things were, previous days’ witness statements painted the former priest as having a “depraved heart” and “mischievous mind,” lead prosecutor Michael Garza described. Feit was, according to testimony from 22 witnesses over the past five days of trial, a man who lacked the ability to control his sexual urges and who became anxious at the sound of women’s heels clicking on the church floor, or the sight of a female kneeling down to pray. Testimony also described him as a man with a history of threatening women, who lied to police in the months after Garza was found floating face down in a McAllen canal, and who — thanks to a cover-up brokered between the Catholic Church and local authorities — remained free for more than five decades. Earlier Wednesday, Dr. Norma Jean Farley, forensic pathologist for Hidalgo County, testified that after reviewing the 1960 autopsy report, photos and police reports, it was her medical opinion that Garza died of asphyxiation by suffocation. Farley was prevented from testifying about the report itself, as it was not entered into evidence, nor was she allowed to speculate about the cause of death. The fifth day in court began with the judge dismissing the defense’s motion for a mistrial, which stemmed from a witness’s accidental reference Tuesday to polygraph tests given to Feit in 1960. Before resting its case, the defense called two witnesses of its own to the stand. 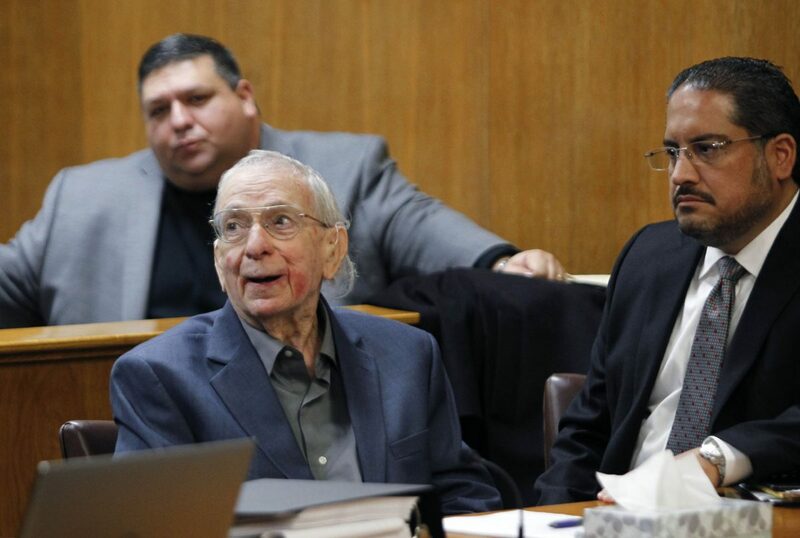 Eighty-six-year-old Faustino Rodriguez, a former high school classmate of Garza’s, testified that he had seen her in line for confession at McAllen’s Sacred Heart Catholic Church on Holy Saturday in 1960. He testified that he believed he saw her waiting in line for Rev. Joseph O’Brien’s confessional around 8:30 p.m., a statement that contradicted the timeline investigators had pieced together, which put Garza at the church closer to 7 p.m.
On cross-examination, however, the prosecution asked Rodriguez about a statement he gave investigators in 2002, in which he said he couldn’t remember anything about that night. In a 1960 statement he gave to police, which was in the wake of Garza’s disappearance, Rodriguez also failed to mention anything about O’Brien. The defense also called Rudy Jaramillo back to the stand. Jaramillo, a retired Texas Ranger who worked on the Garza cold case in the early 2000s, was questioned about the timeframe investigators constructed of the night Garza went missing until her body was found five days later. Jaramillo testified that when he questioned Rev. Richard Junius, one of three priests in the church along with Feit the night Garza went missing, Junius appeared to be “nervous for a reason.” The 2003 interview occurred in Mexico City, where the priest worked as a missionary, and Jaramillo did not share the details of the interview during his testimony. It was also in Mexico City that Junius was murdered in July 2007 — he was found strangled and bound in his bedroom within the rectory of his church. The defense, however, emphasized that Jaramillo only had a “theory” of what happened on the April 1960 weekend in question, as there were no eyewitnesses or forensic evidence recovered that linked Feit to the crime. Both sides will make their final cases Thursday morning when they present their closing arguments to the jury, at which point jurors will begin deliberating the verdict.